Pond Cam Enclosure - the notWildlife Blog - A collection of high quality backyard wildlife photos. Now that spring is here and the pond temperature is warming up, I find myself having to wipe algae from the underwater pond camera lens every day. I am going to build a protective “dome” cover for it. This should provide shade and a protective bubble of air between the actual camera housing and the water. I know that the algae growth will eventually start covering the new dome, but hopefully I can provide enough shade to minimize it. Either way, the modified GoPro underwater camera housing was not designed for 24/7 underwater usage since it has two holes drilled in the side to allow the HDMI and power cables to pass through. I tried to find a glass container for this project, but all of the flat sided containers, such as square vases, had distortions in the glass. I also thought of using a small aquarium, but even the smaller ones are all too large. 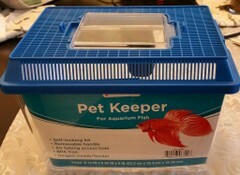 So, I picked up a “Pet Keeper” for aquarium fish from Petco. My plan is to use the Pet Keeper upside down as a protective air dome over the underwater GoPro housing that is currently in use. 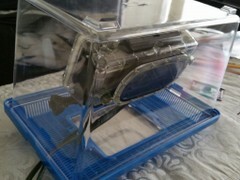 After careful measurement, I fastened one of the flat 3M sticky mounts to the inside of the Pet Keeper. 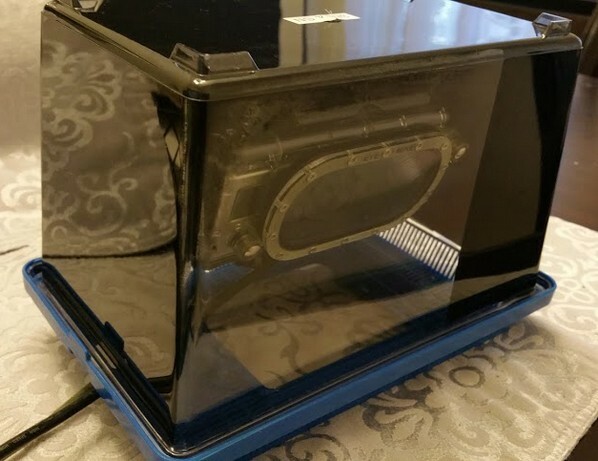 I created a hole in the side of the cover to allow the cables to pass through. The cover will serve as a stand, making the camera height perfect for my application. Here is a final photo of what it will look like when completed. 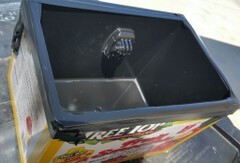 This photo was taken before I painted the inside of the box. You can see how the camera will be positioned inside the new housing. I didn’t do the best masking job, but this should be good enough to keep excessive sunlight out. Sunlight will cause reflections to appear inside the glass between the camera and the water. I am going to use a small amount of rain-x directly in front of the camera lens. This should help prevent fog/moisture buildup directly in front of the camera lens. Below is the final product. Since this will float, I have calculated that if I palce two bricks on top of the enclosure it will provide enough weight to hold it in place. The bricks will also provide additional shade to help prevent some algae growth on the enclosure. Well, what are you waiting for... go check out the live underwater pond cam in action!